Bergenias are herbaceous perennial plants beloning to the Saxifrage family, Saxifragaceae. They have large attractive leaves and clusters of white blooms bornes on nearly leafless stalks. They make excellent border or bedding plants and work well in rock gardens or in gardens with dappled shade. They do well in most soils, but do best in a fairly rich well drained soil. Plants can be propagated by digging and dividing existing plants in the spring or by sowing seeds. For best germination, cold stratify seeds for 2 weeks prior to sowing using one of the following methods. Soak the seed for 24 hours in warm water. Drain the water from the seed. Place a handful of sphagnum peat, vermiculite or other sterile moisture medium and in a zipperlock plastic bag. (Sphagnum peat is best for stratification as it contains anti-fungal properties.) Add enough water to thoroughly moisten the seed and allow it to rest for a couple of hours. Hold the bag upside down and squeeze out any excess water. Add the seed to the bag and shake to mix. Place the bag in a refigerator. An unheated outbuilding or garage will work as long as the temperature does not exceed 41 degrees F.
Do not cold stratify a seed and then fall sow. Once the initial stratification is complete the seed is ready to germinate. If the outdoor temperature warms, the seed will germinate and then may be killed by the freezing temperatures of winter. In addition, once the seed has completed stratification, it is ready to start growing. In this state the seed will use up its energy reserves at a rapid rate and will have a much reduced shelf life at warmer or cooler temperatures. After stratification seeds should be sown in pots, trays or a bed prepared with a soiless medium (1 part sand to 1 part sphagnum peat moss is fine) and covered lightly. The medium should be kept moist, but not soggy at about 70F. When seedlings reach a height of 2 inches, they should be transplanted to larger containers or directly outdoors, if the outdoor temperatures remain above 65F. 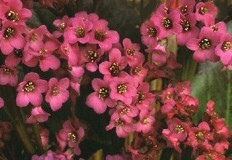 Varieties of bergenia are used as medicinal herbs to treat an array of ailments.